In 2011 JUST HYPE began as a small project, designing printed clothing and accessories. After winning a t-shirt printing competition, JUST HYPE had its first batch of stock, which sold out in a matter of hours. Within months, JUST HYPE Had started to evolve into one of the UK’s most recognisable brands. The first HYPE store opened in the Summer of 2013, and HYPE can now be found stocked in a number of stores worldwide. JUST HYPE has come a long way as a brand since just selling t-shirts and now covers a complete range of clothing for men, women and kids. JUST HYPE wants to serve as a lifestyle brand with products that include pretty much everything you can wear. Free worldwide Shipping when you spend over £60 at JUST HYPE! Verified this month. Valid until further notice. JUST HYPE discount code not required. JUST HYPE offer history Oct	2017 Jan	2018 Apr	2018 Jul	2018 Oct	2018 Jan	2019 Apr	2019 Discount Code 10% off everything with discount code from JUST HYPE! 10% off any product with discount code from JUST HYPE! 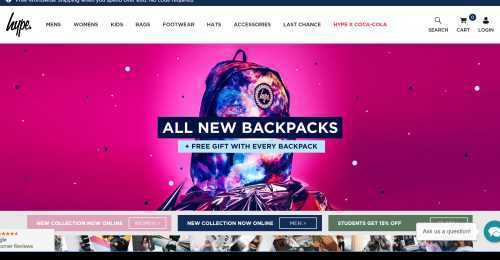 30% off when spending £10 or more with JUST HYPE voucher code Up to £30 off with JUST HYPE voucher code 10% off sitewide with voucher code from JUST HYPE Offer 10% off next purchase when signing up to the JUST HYPE newsletter! 15% student discount at JUST HYPE! Last Chance items at JUST HYPE - Up to 55% off! Delivery Free worldwide Shipping when you spend over £60 at JUST HYPE!